Brad Pitt as Jesse James in The Assassination of Jesse James by the Coward Robert Ford (2007). Nick and I have both mentioned the term "narrative folding" on this site and in other contexts and we're often asked "what does that mean?" The short answer can be hard to describe because the man who we borrow the term from is Ted Goranson, an MIT grad and scientist who is not always easy to understand. His blog, and accompanying links to his thousands of IMDb comments, can be found here. The term "Metafilm" is more common for what we're discussing, but this is generally used only to refer to films whose story is about film. In addition to this, Ted's term includes what is often referred to as "intertextuality" when it's used in a text context. Most of the time, when we watch a movie, we are mostly paying attention to the story as it's being given to us, and a lot of "casual" movie-goers and an alarming number of critics only focus on the story as though it were the only thing going on. People on this level act as though the movie was a real story that happened as presented, ignoring the actors, cameras, crew, editing, marketing, etc. that goes into actually making a movie. Ted Goranson's definition of "folding" encompasses a wide range of semiotic ground where the viewer or the story (or the actor) become aware of something on another plane from the story. Picture planes in three dimensional space, arranged like sheets of paper held a few inches above one another. One plane is the story, another, below that, is the sub-story, and above the story plane is the viewer's plane. If we watch a movie in a vacuum, the three (or more) planes will not intersect at all. When Ted Goranson (or Nick or I) talk about "folding," we're talking about these imaginary sheets of paper "folding" by connecting with one another in some way. In a good movie, it should be something positive, strengthening narrative metaphors, re-inforcing themes, or otherwise helping the movie. On the other hand, a movie can have levels of abstraction that directly contradict what's being provided in the story: a film with a story about being unique and finding your own voice that makes no attempt to be unique, a story about nostalgia for main street Americana produced by a media empire and sold at Wal-Mart (Cars). When this sort of abstraction or "folding" occurs, it tends to be recognized even by those who don't usually pay attention to these things, and can make a movie seem bad even if the story objectively is well done. 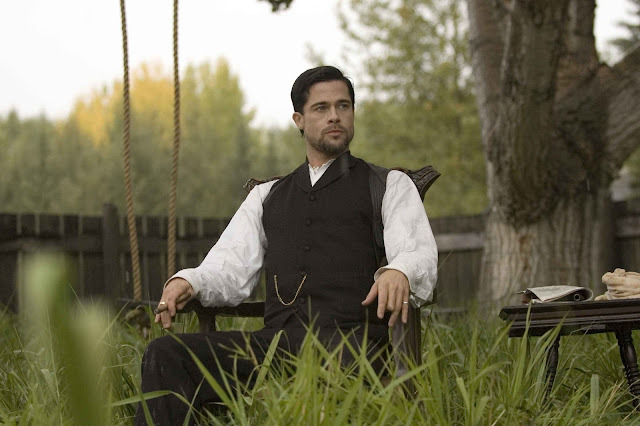 The Assassination of Jesse James by the Coward Robert Ford (2007) and Public Enemies (2009) are two recent (excellent) movies that both rely on casting to achieve a level of "folding" with audiences. Brad Pitt and Johnny Depp are immediately recognizable, and their statuses as real life celebrities is meant to echo their characters' celebrity status in the world of the movie. The movies can and do use other methods to get this message across, but they are free to be subtler, because it is easier to believe a famous actor is a famous movie star. Pitt portraying James's weariness of being idolized and hounded is more believable to the audience because we know how it parallels Pitt's own life for the past decade. If a viewer comes along in 50 years and watches this movie, he may not have any idea of who these actors are or why they are immediately made to seem important, without formal announcements that "Jesse James is a very famous criminal." So this piece of casting works as a "fold" in that it relies on the viewer knowing something beyond the scope of the film. It also makes the actors' performances seem more "real" to the viewer, because we know (or think we know) that Pitt and Depp aren't just pretending, they are incorporating their real experiences into the movie. Unlike metafilm that tries to draw you out of a movie, this kind of "fold" actually uses the star as a means to further themes. Both movies also include another "level" of folding within the world of the movie itself. In Public Enemies, Dillinger is deeply affected by movies, not only James Cagney gangster pictures, which influence his persona, but also Clark Gable romantic melodramas (he's killed just after watching Manhattan Melodrama). In Jesse James, Robert Ford actually becomes a performer, re-enacting the moment that made him a minor celebrity in his own time over and over. This level of "folding" is similar to Shakespeare's common "play within a play" dynamic, where meaning is re-inforced by intentionally calling attention to the story we're being told (Hamlet gets Claudius to watch a play involving family regicide to bait him into revealing guilt). 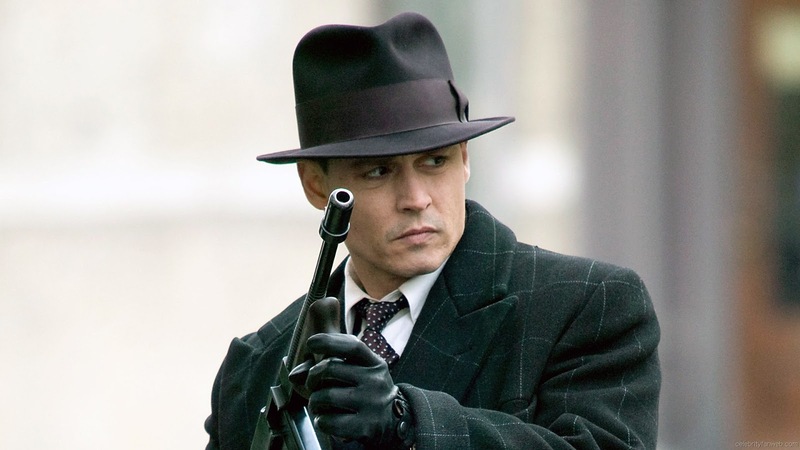 In Public Enemies, Dillinger's infatuation with the movies reveals his shallowness and lack of deep connection with anyone; in Jesse James, Robert Ford's re-enactments elevate the events surrounding the actual assassination to near mythic levels,1 making it the defining moment of Ford's life. In contrast with the casting, none of this abstraction has any requirement that the viewer "get" anything outside of the life of the film--it's all there for the viewer. It also works with other folding by deliberately calling attention to movies or actors acting, things that highlight the artificiality and are cues to the audience that there's more going on than just the story. As far as I know, there's nothing scientific about the term "narrative folding," and it's not used often outside of the academic work of Ted Goranson, but since it's a useful tool for talking about movies, we're going to continue to use it rather than take a term like "meta-__________" and then try to hammer it into shape for our own purposes. 1. So much so that the scene is brilliantly parodied as an alternate Yogi Bear ending.